The ATP Golden Swing on South American clay kicks off on the high altitude courts of Quito, Ecuador for a 250 stop drawing a good number of the ATP’s clay court specialists. 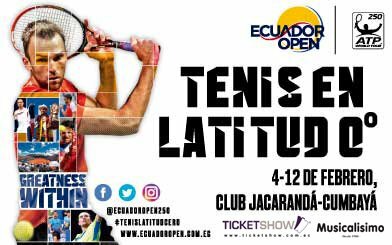 Here is a preview, with predictions for the Ecuador Open. Just one top 20 player is playing in Quito, making this quite an open field early in the season. The 32 year old Tipsarevic has started the season in red hot form, going 10-0 at the Challenger tour level. After being awarded a wild card in Quito, he’ll face fellow veteran Gimeno-Traver, who also used to be ranked higher than he is now. Tipsarevic isn’t as solid on clay usually as the dirtballer DGT, but given his great form, he should win this match, and perhaps make a deeper run in this 250. Veteran Victor Estrella looks set to reach the quarterfinals, given his first two opponents will be a struggling Andrej Martin, and Ivo Karlovic, who is poor on clay, given the red dirt absorbs his powerful serves. Four dirtballers are in the section below VEB, Joao Souza faces qualifier Federico Gaio, while Gerald Melzer will face #6 Horacio Zeballos. None of these players are in great form, but Zeballos over Gaio is my pick to reach the quarters. Given Estrella leads Zeballos in the h2h, the Dominican #1 is my pick to reach the semifinals. Thomaz Bellucci has struggled to start the season, this gives Janko Tipsarevic a great opportunity to defeat him and DGT to reach the quarterfinals. Santiago Giraldo should defeat Benjamin Becker, who is poor on clay, and then I have him defeating Renzo Olivo, after Olivo dispatches Emilio Gomez. Olivo has been solid below the tour level, but Giraldo is more experienced in ATP matches, and should play better at a high altitude. I have Tipsarevic defeating Giraldo to reach the semifinals. A solid clay courter at the ATP level, Albert Ramos should be good enough to defeat qualifier Alejandro Falla or Alessandro Giannessi in his first match. 22 year old Thiago Monteiro has a favorable draw, opening with wild card Giovanni Lapentti, followed by either qualifier Roberto Carballes Baena, or Rogerio Dutra Silva. The matchup between RCB and RDS is a toss-up, but Monteiro is my pick for the quarterfinals, before falling to Ramos. Paolo Lorenzi is coming off of Davis Cup duty and should face qualifier Agustin Velotti in round 2, presuming Velotti defeats Matthew Ebden, who is poor on clay. Fatigue could play a factor for Lorenzi, but otherwise he should reach the quarterfinals and face an Argentine, either Nicolas Kicker or Guido Andreozzi. Alexandr Dolgopolov is also in this section, but he’s been struggling for a while, and a win over serve and volleyer Rajeev Ram in round 1 likely isn’t enough to give him a boost on clay, a surface he’s hit and miss on. Lorenzi over Andreozzi is my pick in the quarters. The formerly top 10 Tipsarevic has endured a rash of injuries, but is on the cusp of returning to the top 100. He has a shot at reaching 300 career tour wins this season, after posting seven last season. The draw in Quito makes the title ripe for the taking, and if the Serbian can find his form on clay, he could leave the tournament as champion. Ramos should be fresher than Lorenzi, while Tipsarevic’s form gives him a slight edge over Estrella despite having lost their only h2h match. Ramos has won his last two matches against Lorenzi (2-2 h2h). Estrella is bidding for a third straight title in Quito, and that adds yet another wrinkle to a potential semifinal clash with Tipsarevic. It’s hard to predict a champion in Quito, but on clay, Ramos is as good of a pick as any from this field of 28.